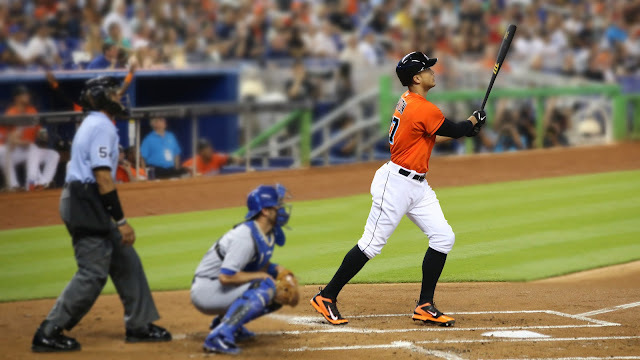 Giancarlo Stanton can crush baseballs. Following a much-needed rainout after Wednesday night's extra inning game, the Reds welcome the Miami Marlins to town. The Marlins were a popular pick in the preseason as a team on the rise, thanks to a strong performance last year, a very good core that they've started to lock up, and some offseason acquisitions that signaled a "win-now" strategy. Not the least among those was the acquisition of Mat Latos for Anthony DeSclafani, although the Reds will miss their former starter this go-around. 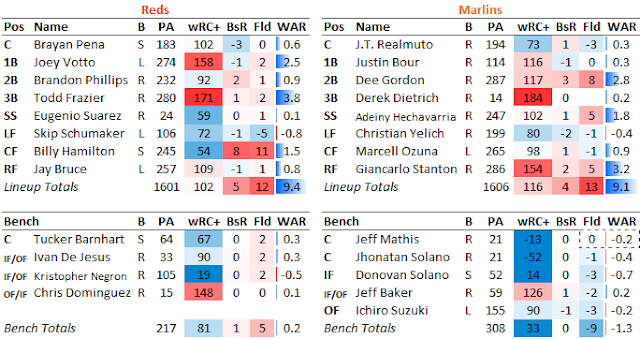 The Marlins have had ok relief pitching and have fielded well, but their offense has been pretty miserable all season outside of Giancarlo Stanton, and their starting pitching has been disappointing. The preseason thought was that if they could just make it until Jose Fernandez gets back, they might have a shot. At this point, though, they're 7 games behind the Mets, and are only "in" the race because no team has been particularly good in the NL East. I haven't watched many Marlins games this season, but I keep seeing clips of Giancarlo Stanton's master blasts. And Dee Gordon has continued to exceed expectations, at least of those of the stats community. He's been superb over the past season, though I do think it's fun to compare his baserunning totals to those of Billy Hamilton. Gordon is the better hitter, though, and at this point in his career is the better all-around player. I was surprised to see how badly Christian Yelich has struggled this year, because he seemed like a really nice player to lock up this spring when the Marlins signed him. Finally, yes, the Solano brothers are actually brothers! Neat, right? Have I mentioned that Todd Frazier has been the best third baseman in the NL the past two calendar years? Oh, right, I have. Good to see Jay Bruce's wRC+ push well up over the 100-mark after a strong series. He could still end up with a decent season if he gets hot. I'm been pretty encouraged by what I've seen from Eugenio Suarez thus far. Brayan Pena has been hot lately as well, and would almost be at a full win over replacement if he wasn't so slow. Did you see Ian Kinsler let a not-called infield fly drop last night to exchange Jay Bruce for Pena on the bases? Clever move. Glad to see Pena still score. If you go by this year's numbers, this doesn't look to like it will be a particularly well-pitched series. The guy currently in the Marlins' rotation that I was most interested in seeing, Jose Urena, isn't throwing. Koehler and Phelps are both late-20's guys. Dan Haren is somehow only 34. I figured he was pushing 40. The Reds pen is huge right now, at least by sheer volume of names. I think we're all pretty charged up about the job that Donovan Hand did last night. Frazier deserves a lot of attention for his monster night, but Hand held a very good Tigers offense for three innings in his first big-league appearance in two years.